There are a handful of easy breakfast recipes I rely on to make my weekday morning’s fuzz free for both kids and me. If I can get them a proper breakfast in the morning, I am little worried if they skip eating few things from their lunch box. My daughter is not a big fan of cereal. Recently my kids started to enjoy steel cut oats after a long time of persistent trial. My little one always loved oat in any form. He is the one who will eat any veggie as raw. He is not too fond of spicy or sugary food. Herbed and spiced baked sweet potatoes in salad are something my family likes. I baked some plain sweet potatoes other day; cubed and thread into a skewer and paced as a snack in my kids' lunch box. I noticed the untouched sweet potato kebab in my little one's lunch box and inquired. His reasoning was 'Mommy, sweet potato was sweet! !’ I managed to control my chuckle and told him not to waste food. I was ardent to use all the plain baked potatoes I had baked as everyone seemed to like the spiced version. It was rational to use them in something my kids would like to have when they are hungry. Without much thinking I knew how I could disguise the baked sweet potatoes in their meal. But my zeal for the new experiment didn't stay calm in me and I accidentally announced that I am going to make some sweet potato pancakes. There came my elder one pleading not to use it in the pancakes, because he didn't want to spoil his pancake breakfast by Mom's egg-less experiment. Let me remind you, he is the one with the most sensitive taste buds. He could detect any taste difference. Anyway, I went with my guts and thought to give it a try. 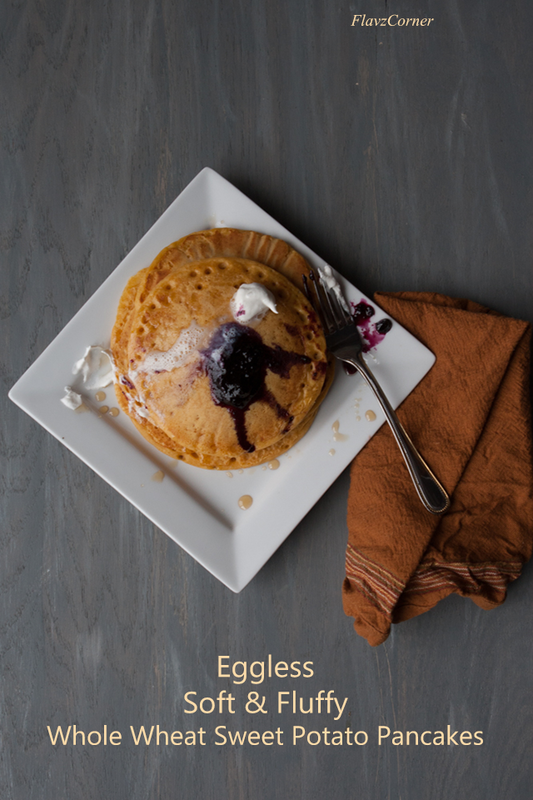 Since we are observing lent and cannot use eggs, I knew that sweet potato will be a good substitute to give the softness to the pancakes. Besides this vegetable have many health benefits too. The first pancake was taste tested by my elder one. The gesture that reflected on his face after the first bite conveyed that he loved it so much. He kept asking for more straight from the griddle. Well who could deny a stack of warm soft and fluffy pancakes with a drizzle of pure maple syrup topped with homemade mixed berry jam and a dollop of whipped cream!! I really liked the soft and fluffy texture of the pancakes and it was indeed a great egg-less breakfast. Sweet potatoes are high in vitamin A, vitamin B5, B6, thiamin, niacin, riboflavin, and, due to their orange color, are high in carotenoids. The vitamin B6 vegetable helps to lower the risk of blood vessel and arteries hardening. Their potassium content helps to lower blood pressure by maintaining fluid balance. It is a heart healthy vegetable. Sweet potatoes have low glycemic index which helps to control blood sugar and maintain energy. The Magnesium content in sweet potato promotes relaxation, calmness and a good mood, as well as artery, blood, bone, muscle and nerve health. 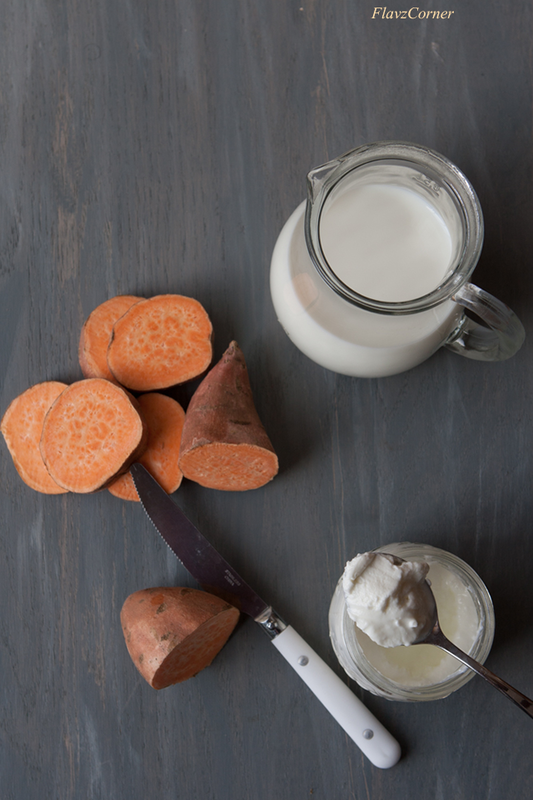 Due to the color-pigmented vitamins, sweet potatoes are high in anti-inflammatory and antioxidant benefits. They provide excellent skin and hair care. Their high fiber content regulates digestion. Pre heat oven to 450 F. Wash 3 medium size sweet potatoes and poke them with a fork. Wrap them in a aluminum foil and place on a baking sheet and cook for 30 - 35 minutes. Let them cool. 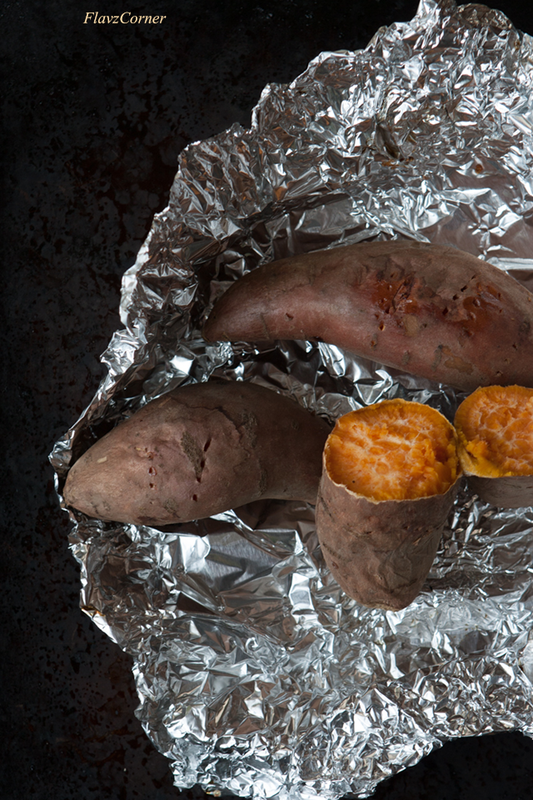 Unwrap the foil and use a knife to cut open the sweet potatoes. Using a spoon scoop out the flesh and roughly measure up to 1 cup. Place the cooked sweet potatoes pieces in a blender or the puree in the blender. Add milk, yogurt, oil and maple syrup and blend for 30 seconds. Now add all the dry ingredients to it and blend for a minute or till everything is incorporated well to form the batter which is appropriate for pancakes. The batter shouldn't be too thin. If too thick, add more milk to get the desired consistency. Apply some butter/oil on a non stick pan/griddle and rub with a paper towel. When the pan is hot, lower the flame to stay between low to medium; pour a medium size ladle of batter on the pan and spread to form a small circle. Wait till small bubbles start to appear. Flip the side and cook till both sides gets golden yellow brown color. Make pancakes with rest of the batter. Serve them with your desired toppings. I usually serve pancakes with some whipped cream, pure maple syrup and homemade jelly. You can top them with fresh cut fruits and honey or fruit compote too. Make sure to cook the pancakes on low flame to avoid burning and cook all the way through. Depending on the texture of the wheat flour you are using, you may have to adjust the amount of milk in this recipe. Start with 1 cup of milk and then adjust by adding 1/4 cup at a time to get the desired consistency. 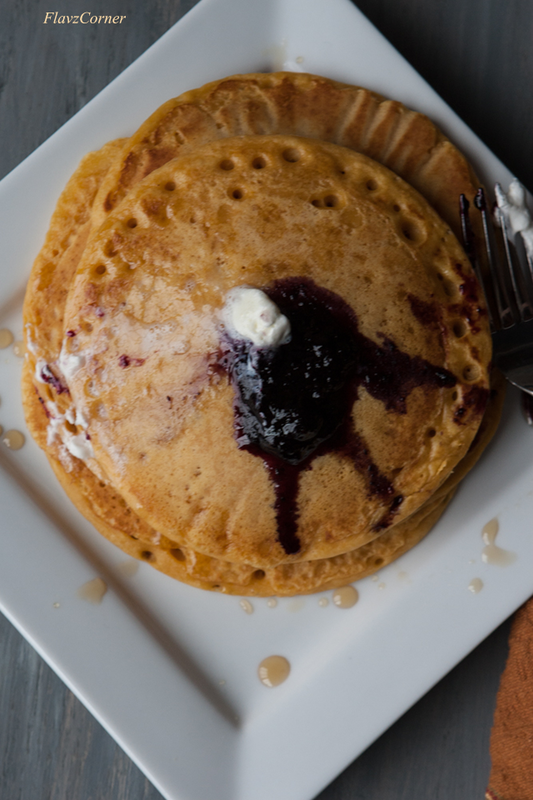 The sweet potatoes gives the nice soft fluffy texture for this pancakes. So try not to avoid them when you are not using eggs. You can substitute the sweet potato puree with pumpkin puree. You can bake the sweet potatoes a day ahead to make an easy breakfast in the morning. You can also make the sweet potato puree ahead and store in an air tight container in the fridge for a week. They can stay fresh for few months in the freezer. You can flavor the pancakes with some nutmeg along with cinnamon. Didnot know sweet potato is good for hair...oh I should get some then.Thanks for all the info on sp. Looks very soft n fluffy...healthy ones,I haven't used sweet potatoes in pancakes till now...I must try,love it! I LOVE sweet potatoes..these pancakes are definitely a must try. I love sweet potato pancakes! Haven't made any in ages (years! ), and you've reminded me it's been way too long. Yours look great -- thanks. Dear Shibi, they look so tempting. I would love to try them one day!